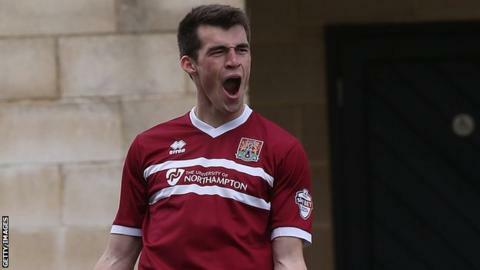 John Marquis struck to give relegation-threatened Northampton a crucial win against Burton Albion in League Two. The Cobblers' first home win in six games leaves them level on goal difference with third-bottom Wycombe ahead of the two sides meeting on Friday. "We've done it together today and I'd like to thank the supporters for the help and backing they've given everyone on the pitch. "It'll be a difficult game at Wycombe but hopefully we'll take a big following; we can go and win there, but we have to play well. "Kelvin Langmead's done extremely well to get back to this stage after the injury he's been through. I like players like him, who put everything on the line for their club." Match ends, Northampton Town 1, Burton Albion 0. Second Half ends, Northampton Town 1, Burton Albion 0. Attempt missed. Billy Kee (Burton Albion) right footed shot from outside the box is too high from a direct free kick. Ian Sharps (Burton Albion) wins a free kick in the defensive half. Foul by Kelvin Langmead (Northampton Town). Foul by Brennan Dickenson (Northampton Town). Corner, Burton Albion. Conceded by Evan Horwood. Shane Cansdell-Sherriff (Burton Albion) wins a free kick on the right wing. Substitution, Northampton Town. David Moyo replaces Emile Sinclair. Corner, Northampton Town. Conceded by Shane Cansdell-Sherriff. Attempt blocked. Brennan Dickenson (Northampton Town) left footed shot from the centre of the box is blocked. Attempt missed. Emile Sinclair (Northampton Town) right footed shot from outside the box is high and wide to the right. Attempt saved. John Marquis (Northampton Town) left footed shot from the centre of the box is saved in the bottom left corner. Substitution, Northampton Town. Brennan Dickenson replaces Alan Connell. Alan Connell (Northampton Town) is shown the yellow card. Foul by Alan Connell (Northampton Town). Substitution, Burton Albion. Gary Alexander replaces Jimmy Phillips. Ashley Hemmings (Burton Albion) wins a free kick in the defensive half. Foul by Leon McSweeney (Northampton Town). Attempt missed. Chris Hackett (Northampton Town) right footed shot from outside the box misses to the right. Corner, Northampton Town. Conceded by Robbie Weir. Corner, Northampton Town. Conceded by Ian Sharps. Evan Horwood (Northampton Town) wins a free kick on the right wing. Corner, Northampton Town. Conceded by Adam McGurk. Corner, Burton Albion. Conceded by Emile Sinclair. Adam McGurk (Burton Albion) hits the bar with a left footed shot from a difficult angle on the left. Attempt blocked. John Marquis (Northampton Town) left footed shot from outside the box is blocked. Corner, Burton Albion. Conceded by Richard Ravenhill. Attempt blocked. Billy Kee (Burton Albion) right footed shot from the centre of the box is blocked.